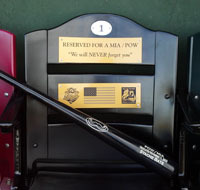 The Lexington Legends celebrated Veterans Day by permanently reserving a seat at Whitaker Bank Ballpark in honor of military personnel who are prisoners of war or missing in action. A ceremony to dedicate the seat was held at the ballpark today (Monday). 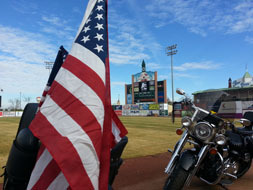 Members of Rolling Thunder, an organization of motorcycle-riding veterans, made their entrance through the outfield gates and rode their motorcycles around the warning track before coming to the seating bowl for the ceremony. The national anthem was sung by Sgt. Shawn McCall. Students from Forest Hill Military Academy, including a color guard, also took part. “The Legends are proud to take this step as a way to remember those who have sacrificed on our behalf,” said Legends President/COO Andy Shea. 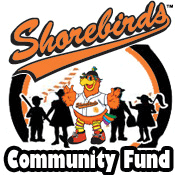 The Shorebirds Community Fund and Sherman paid a visit to South Dorchester School in Church Creek Maryland to award them a check for $1,000. South Dorchester School was one of over a 100 schools that participated in the 2013 Hit the Books reading program presented by Dr. James M. Crouse at The Brace Place and came in first place in the ticket redemption contest. Congratulations to all the students, their parents and faculty members of South Dorchester School for a job well done.